On My Own: Are You Ready to Fly? 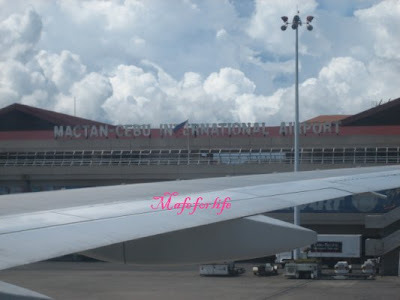 Showing you the beauty of Mactan International Airport. Can You figure out my wing? I mean, the wing of the plane? Ready and packed for my travel alone. I left my heart in Cebu. Leaving and parting time is not that easy as it is as to chew a gum. The pain lingers more and it depends on how you deal with it after you parted ways. What I did at the airport was never turn back once I said my goodbyes with them in the departure. I hurriedly went in and read something. I just don't want to really focus on missing them at that moment. However, when I was on board and the plane took off, I saw the place where I used to stay for almost 25 years. I just couldn't help but shed some tears down my cheeks not minding the couple beside me. I didn't care if others saw me cry. Crying is a therapy and strength, isn't it?